We have been having a bit of a heat wave in L.A., so I have been avoiding turning on the stove or oven. This caprese chicken from Baked Bree is the perfect light summer meal. 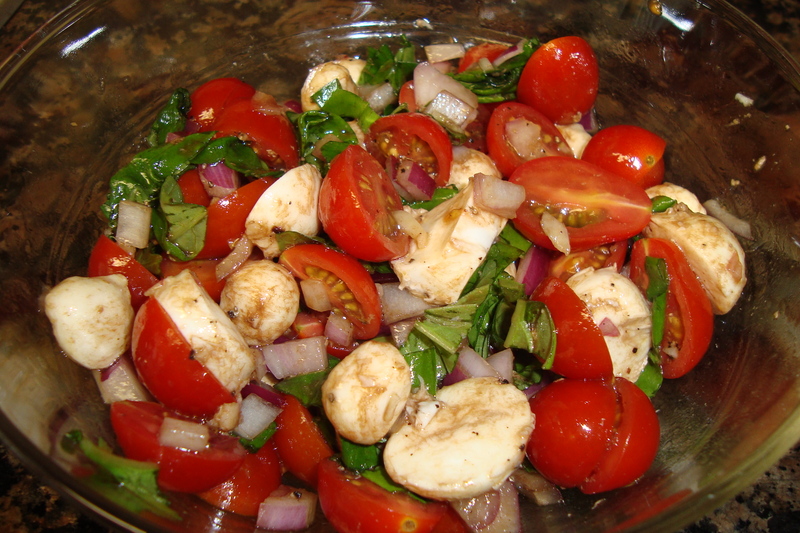 To make the salad, put the tomatoes, mozzarella, and red onion in a medium-sized bowl. Season with salt and pepper, then drizzle with vinegar and oil to taste. Add the basil and toss. Cover and refrigerate until ready to use. Season the chicken on both sides with grill seasoning. Grill on medium-high heat until the chicken is cooked through. 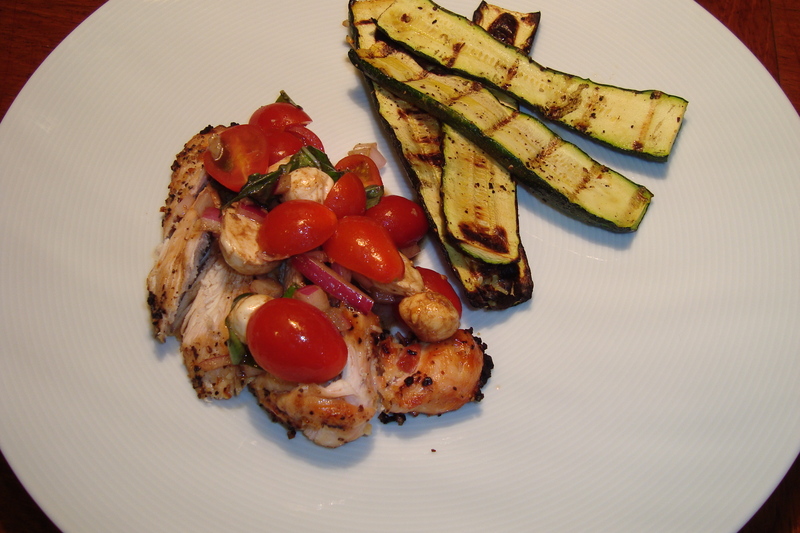 Serve the chicken with the caprese salad on top. 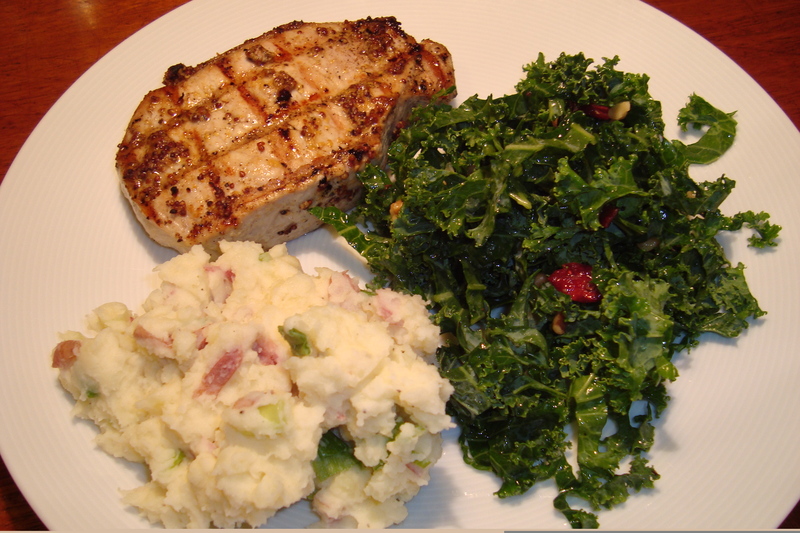 Last night we had grilled pork chops (brined first, of course!) with mashed potatoes. Kale salad was the perfect vegetable side. Kale is a tough enough green to stand up to a heavier entrée and side, but the salad felt summery. Toss the kale with the lemon juice and a drizzle of olive oil. Season with salt and pepper, then add the walnuts and cranberries. Paco is in Dallas this week, but for whatever reason, right before leaving for Texas, he wanted to make ribs. He bakes them slowly in the oven so that they’re tender but not falling off the bone, then finishes them on the grill. 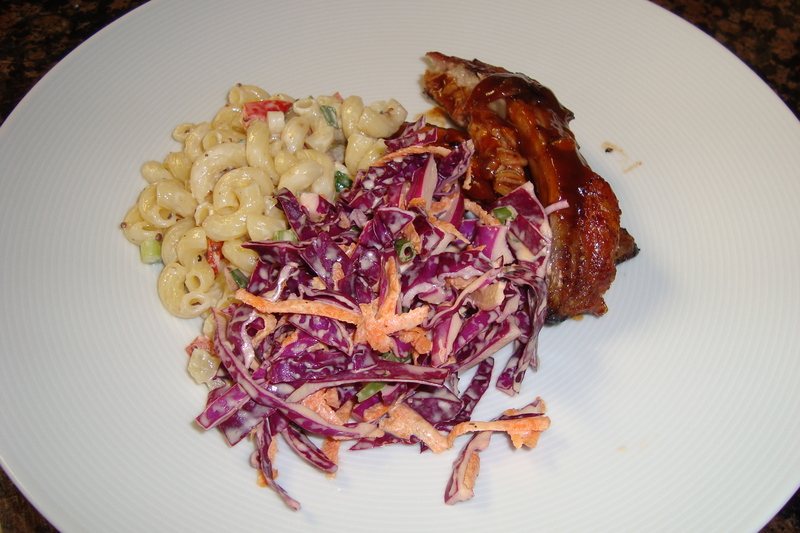 We served them with macaroni salad and sweet and tangy cole slaw. This would make a great 4th of July meal! Preheat the oven to 200 degrees F. Place the ribs on a baking sheet, and season both sides with salt, pepper, garlic powder, and cayenne. Cook for three hours. 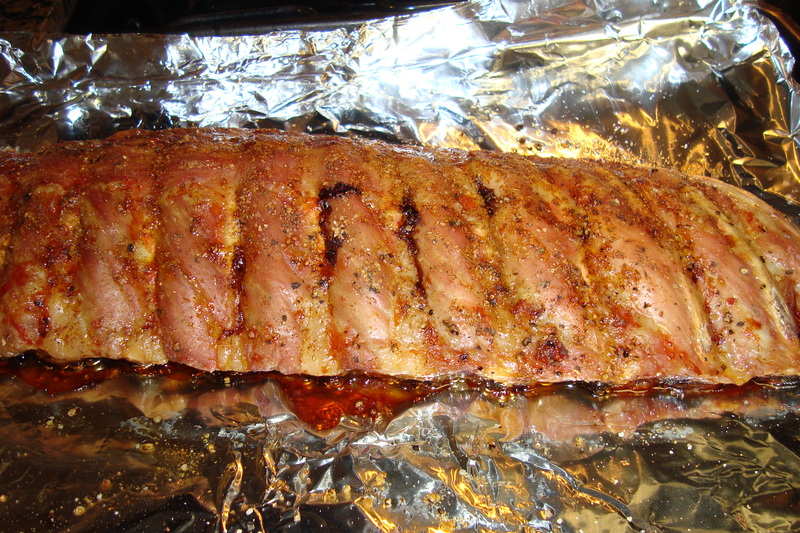 When the ribs are tender, remove them from the oven. Preheat the grill to medium high heat, then grill for 10 minutes on each side. While the ribs are cooking, baste them with barbeque sauce. 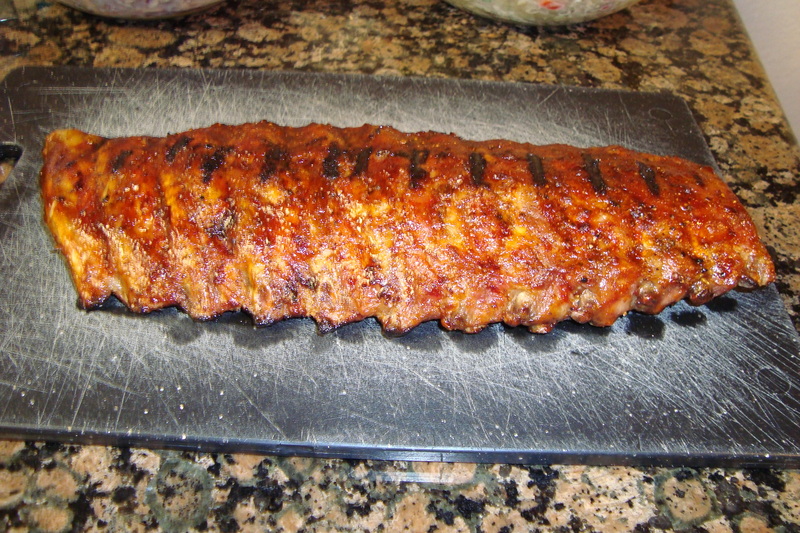 Slice the rack into individual ribs and enjoy! We buy boneless legs of lamb at Costco, cut them into three pieces, and freeze them individually. Leg of lamb is great roasted, grilled, stewed, and ground for burgers. When we lived in San Francisco, we used to roast it. While delicious, this can leave your whole house smelling like lamb for days, and the drippings in the roasting pan are hard to clean. Now that we have a patio and a grill, we can get an even better char on the outside by grilling it, without the messy clean-up or lingering smell. If you don’t have a grill, it’s still worth it to roast it in the oven. Cover your pan in foil before putting the lamb in it, so that you won’t have to scrub the pan as much. For whatever reason, lamb fat is very hard to clean. Keep a window or door open while cooking, to allow the smell to escape. 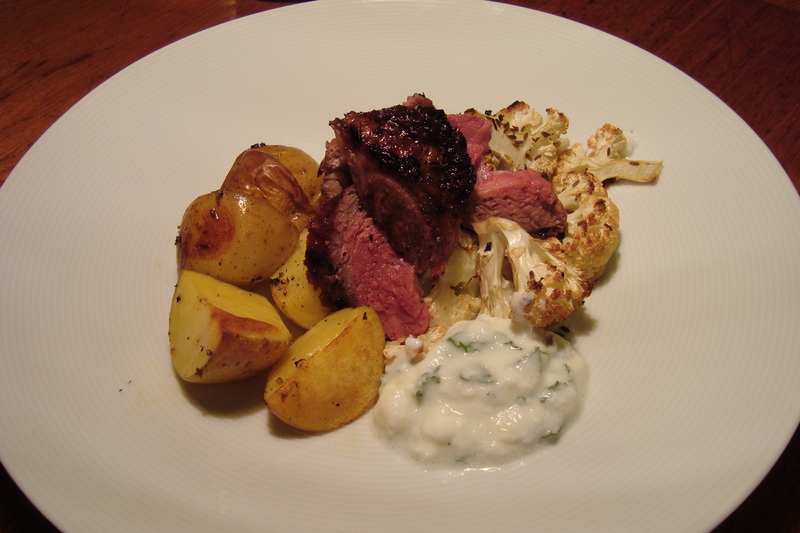 We served last night’s lamb with roasted yukon gold potatoes, cauliflower roasted with cumin seeds, yogurt and mint sauce (recipe below), and chili sauce. Season the lamb generously with salt, pepper, oregano, garlic, and black pepper. Add the olive oil and lemon juice, cover, and marinate in the refrigerator for 4 hours. Grill on medium-high heat for 12 minutes on each side, depending on the thickness of your lamb. (Butterfly it for quicker cooking time.) Remove from heat and rest for at least 10 minutes to allow the juices to redistribute, then slice against the grain. Put all ingredients in a small bowl and stir to combine. In high school, I used to love the barbeque chicken salad from California Pizza Kitchen. We were craving grilled chicken on Saturday, but wanted to mix it up a bit from our usual slaw. 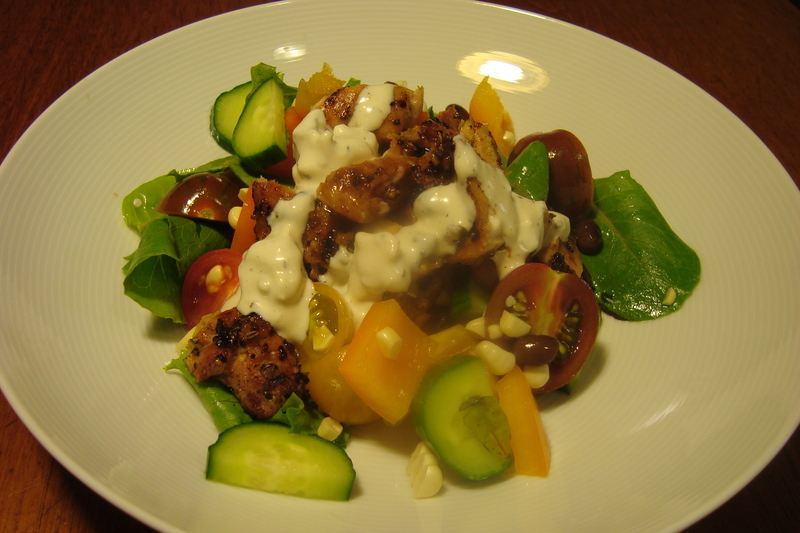 The creamy, salty blue cheese dressing was a lovely complement to the charred, sweet chicken. I even ate the tomatoes, which I usually pick out of salads. Season the chicken thighs with salt and pepper. Grill for several minutes on each side, until almost cooked through. Brush with your favorite barbeque sauce, and cook for another minute on each side. Combine all salad ingredients in a salad bowl. Toss together, then serve with chicken and blue cheese dressing. Combine the mayo, sour cream, lemon juice, worcestershire sauce, salt, and pepper in a small bowl. Stir until smooth. Crumble in the blue cheese, and stir to combine. Taste and adjust seasoning as necessary.